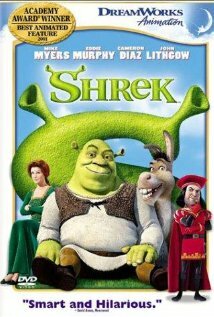 Shrek (2002), directed by Andrew Adamson and Vicky Jenson, addresses the life and problems of the most loveable green ogre that ever walked his swamps. Mike Myers plays the big guy, and voices him with that customary half-serious, half-sarcastic tone that we have come to know so well. 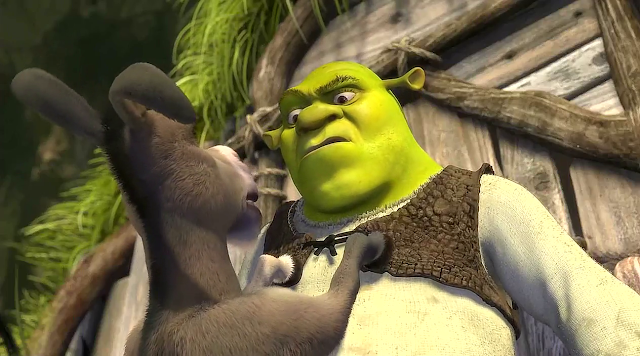 Shrek kind of fancies the little lady. 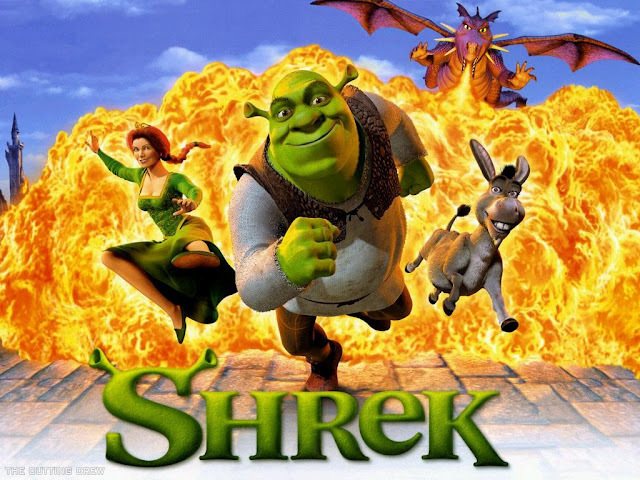 Mike Meyer's character is shocked to learn that the swamp has been overrun with all sorts of fairytale creatures put there by the scheming Lord Farquaad (John Lithgow). 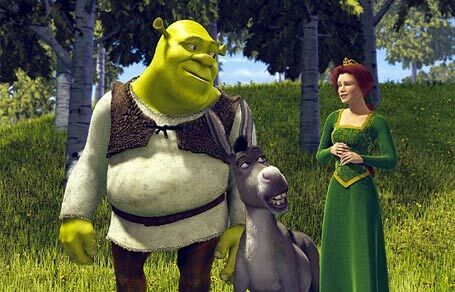 Shrek and his friend the donkey (Eddie Murphy) try to convince Farquaad to return his swamp to the way it was, but they don't get very far. 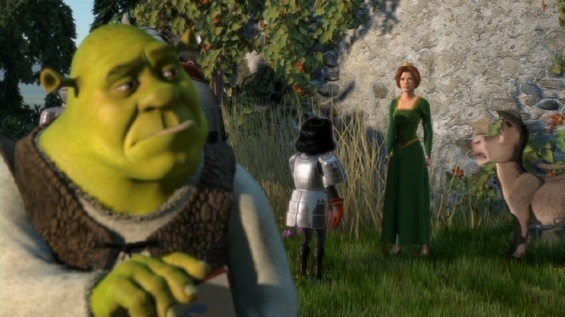 Instead, Farquaad makes a deal: if Shrek will do something for him, he just might do a little something for Shrek about his swamp problem. 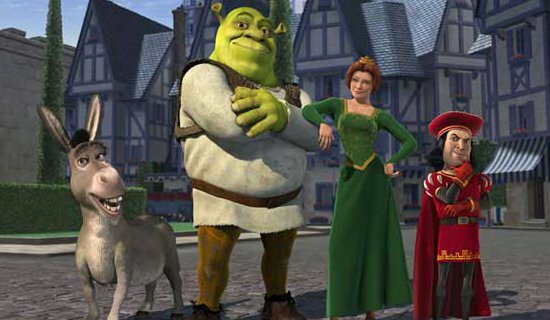 It turns out that Lord Farquaad has designs on the throne, and he wants Shrek to rescue Princess Fiona (Cameron Diaz) and give her up to him so that he can claim her hand in marriage. 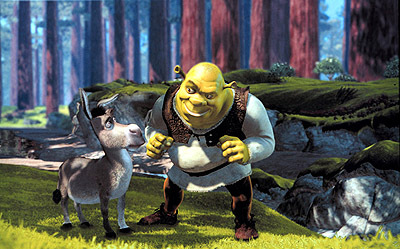 Shrek agrees, because it seems the only way to get his peace and quiet back. It is very much OK to prefer traditional hand-drawn animation, which no computer can completely emulate, but computer animation is the cutting edge of the field. It is similar to the old digital vs. film, cd vs. phonograph, horses vs. cars arguments. They all continue to have their place, the old ways often enjoy a slight quality advantage, but the economics of the different innovations in technology usually swing the majority of users in the new direction. That is what is happening with computer animation. Sure, having 2 million bubbles drawn by hand makes them unique - but that takes thousands of man hours. Doesn't it make sense to just press a few buttons and have almost the same result? It was this.. no, THIS big! 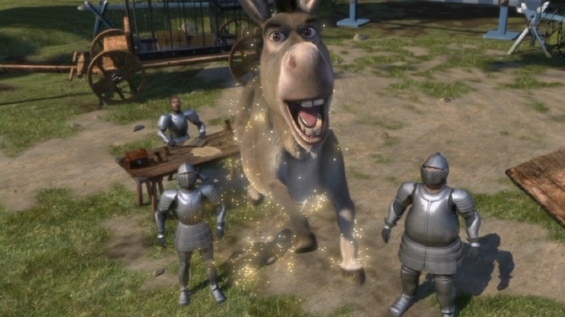 Eddie Murphy plays the loudmouthed donkey and appears to have a lot of fun with the part. Many would say that he steals the picture. Mike Myers, though, is the star, and he makes sure that he gets the best lines ("What is he compensating for?"). Well, ok, the lines aren't all that very memorable, but they are funny when you see them in the film. Fiona is drawn very well. Director Mike Adamson maintains a fast pace while keeping everything friendly and sentimental. There are clear references to "Snow White and the Seven Dwarfs" and other classic animated films, and, of course, we have a princess who wants only to find her man.This film's message is that the right man might not be in the body you thought he should be. Look below the surface and find a treasure. No, the Spock pinch works like this! There is a lot of violence in this film. That makes some parents place it off-limits to their kids, which is a shame. There also is a fair share of foul language. Some kids can handle that, others, not so much. Everyone must draw their own line on that, nobody can do it for you. No, I want the couch against the wall and the bookcase in the corner! An aggressive tone pervades the proceedings, with the donkey being loud, some fights and so forth and so on. That gives the film a bit of an edge, but really, what do you expect when the main character is a big green monster who doesn't suffer fools lightly? I cheated here, Puss doesn't show up until the next film. So, consider this a preview of coming attractions. The film is most excellent fun. The box set that contains all the sequels makes a nice gift. 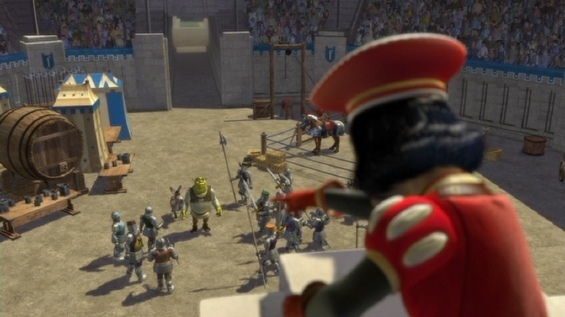 The series didn't end with Shrek's story: a new character is introduced in Shrek 2, Puss in Boots (see the picture above), who became a fan favorite. That led to 2011's "Puss In Boots," which is a very good film also. 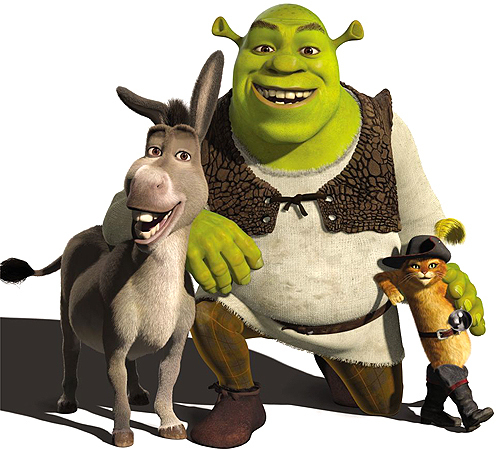 The Shrek universe continues even if the actual Shrek story has run its course and the big green has retired to his swamp. The donkey looks like he really wants to get his good side shown in this shot. You definitely should check this one out. Along with "Cars," "The Incredibles" and the whole "Toy Story" series, "Shrek" should be on the "must see" list.